Turns out, the only thing you have to do to convince Sabrina to come to the dark side is to threaten everything she loves. It only took ten episodes of television, but Sabrina is now exactly where the Dark Lord wanted her. She’s even got the new hairdo and wardrobe to prove it. 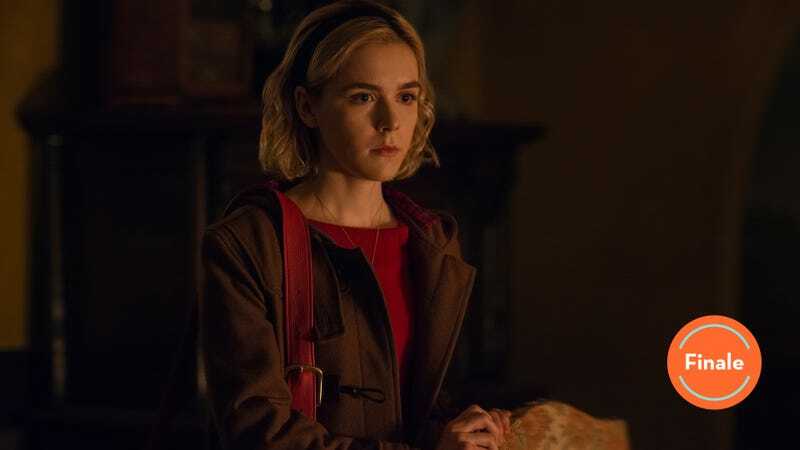 After a great deal of time and effort, Wardwell finally manipulated her into doing the thing she needed to do, leading Sabrina away from the high school full of endangered mortals and right back to the clearing in the woods she ran from earlier this season. The show has made great strides from its earlier, overstuffed episodes. A lot of this has to do with Sabrina grappling with what being a witch means. It was easy enough to continue straddling both worlds when she hadn’t performed any magic that shook her sense of who she was and what she was capable of, but the minute she slit Agatha’s throat, she became a very different person. 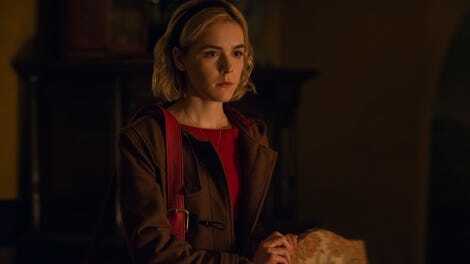 Even if she knew Agatha would likely survive, choosing to go forward at that point was a tipping point for the character, a warning sign of her own inability to make good decisions where Harvey is concerned. She’s not the only one making decisions she can’t come back from. Zelda makes a pretty shocking leap, choosing to protect Father Blackwood’s daughter from his need for a male heir. Blackwood, meanwhile, is so convinced of his own rightness that he sees nothing wrong with proclaiming in front of Prudence that an infant is his true heir. Prudence also, presumably, knows that Zelda stole the baby. Those three now have a very tangled and confusing web of relationships with each other, most of them mixed up with Blackwood’s refusal to show either of the other two any real affection. Ambrose, meanwhile, has gotten himself roped into being one of Blackwood’s true believers, and is clearly weighing his desire for freedom with his sense that he’s fallen in with the exact wrong group of people. Does he still not know that Luke was given a love potion? And at this point, is the love potion still in effect? The strength of Luke’s response to Ambrose trying to protect the mortals suggests it might be. Love, or the prospect of it, also seems to be a concern for Hilda now. Who, or what, is her new beau? Maybe he can be some kind of neutral creature who only wants the best for her! That would be a nice shift. In the meantime, she’s making great strides for herself, protecting the high school single-handedly and moving out of her shared bedroom with Zelda. It’s not clear how interested she is in raising a new baby, though, or what it will mean for Zelda to be a godmother to one baby and a secret mother to another. All of which is to say that Season 2 will have a lot of interesting paths to take. After pushing Sabrina to sign the book, will Zelda and Hilda find that she’s not quite the niece they knew and loved before now that she has? And will Sabrina have any ability to come back to the person she wanted to be? Will anyone, ever, suspect Ms. Wardwell of anything? Zelda had some very sweet, meaningful advice for Sabrina about dealing with grief. She’s possibly the most improved character over the course of the season. In early episodes, she was mainly there to be the mean aunt, but there’s a lot more nuance to her now. Well, I finally looked up Gehenna, the name on the school building, and per Wikipedia, our finest reference, it’s a destination of the wicked. I’m not sure if Tommy’s death was supposed to be a mystery? Cutting away before the final moment introduced an element of uncertainty. The season was definitely a little up and down, but what it became in the final couple of episodes was a much better version of the show. I think it’s still got problems figuring out what to do with the mortal world, but at least everyone is in on the big secret at this point.